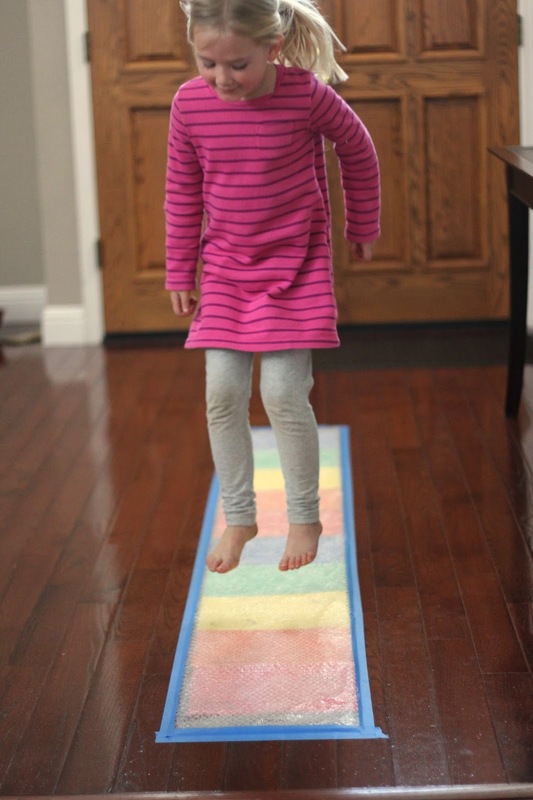 Do you have kids with a lot of energy like I do? We are always looking for ways to get energy out indoors (since sometimes we are stuck inside), so bubble wrap is one of our favorite play tools. Teach Preschool shared this cool popping path which inspired us to make our own rainbow themed popping activity! We had fun exploring colors and alphabet letters while getting some energy out and having FUN with bubble wrap! Write alphabet letters on each piece of cardstock. We wrote lower and uppercase letters together. We used the letters in my kid's name since those are the letters that are moat important to them right now. 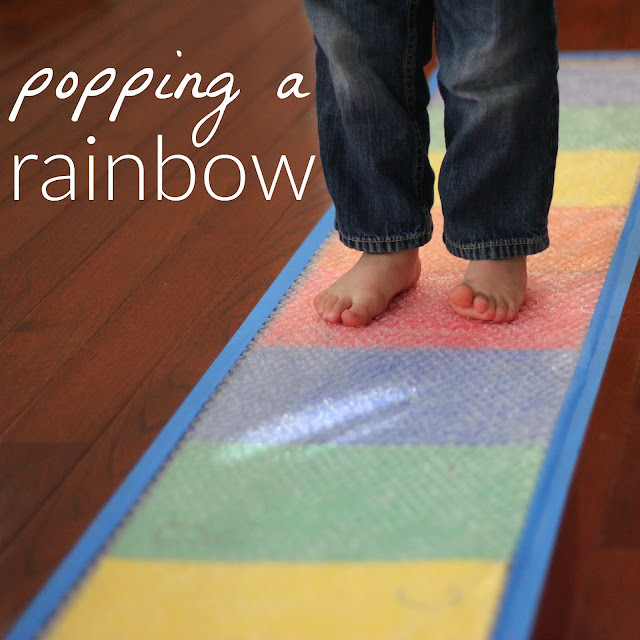 Tape the colored sheets together and to the floor to make a rainbow path. Next, cover over the path with a roll of bubble wrap and secure it in place using painter's tape. After you roll down the bubble wrap, tape around the entire thing to hold it in place. Once that is done, you can start popping! We popped with hands, feet, elbows, knees, etc. Jumping and running was the most popular activity. We also explored ways to pop louder and softer. In addition to just running, jumping, and popping, we also did a few learning activities. We jumped on the alphabet letters to spell our names, said the alphabet letters when we jumped on them, said words that started with each alphabet letter when we jumped on it, and we said the color of each section and named objects that were those colors when we jumped. We sure had a lot of fun popping a rainbow and getting some energy out! Next I think we are going to make the path go all around our living room. Have you ever created or played with bubble wrap? We've done apple bubble wrap art, made bubble wrap LEGO bricks, and painted with bubble wrap. 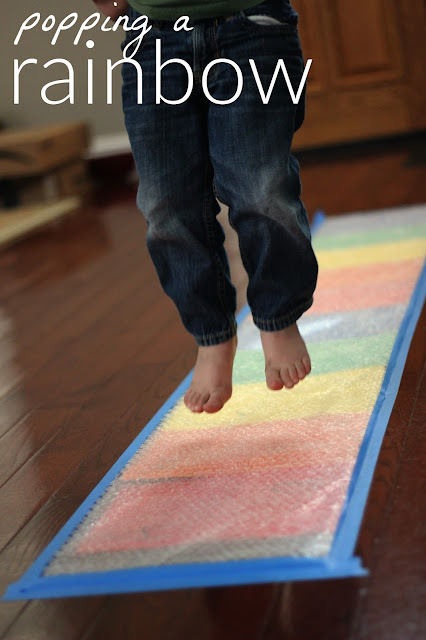 I love the bubble wrap stomping activity shared by Mess for Less as well. I'd love to hear what you've done with bubble wrap.